We have been working on our projects for two months now, and we only have two more to go! Time has been flying by, yet that also means I have been able to see progress with my project. I always love moments like this in projects or life in general when you can finally see all of your work paying off and you can finally see progress and results. 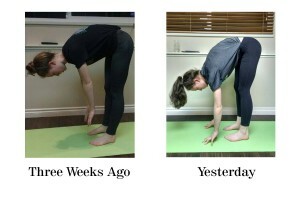 This is me trying to touch my toes while standing three weeks ago versus now. This is me trying to touch my toes while sitting three weeks ago versus now. touching my toes while standing. The photo on the very left was taken three weeks ago, and the one directly to the right of that was taken yesterday. I know my back and legs aren’t perfectly in-line, but I am still working on that, and hopefully by the end of the project they will be straight! The photo to the right is similar, but instead shows me trying to touch my toes in a sitting position. I might show my progress every blog post from now on so you can see all of the progress I have made! 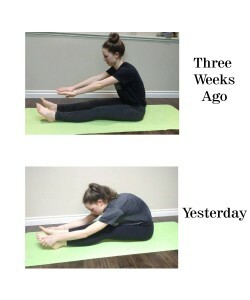 I think that improving my flexibility (if I keep it up) will help me throughout my entire life. Today, at our adventure trip meeting, Ms. Bogen mentioned that it was very important to have good flexibility for kayaking (what a coincidence right?). It’s also a great thing that the adventure trip takes place a few days before In-Depth, so I can hopefully be very flexible by then. 1. What has been my most difficult mentoring challenge so far? Why? I think that the most difficult mentoring challenge I have face so far is the lack of one-on-one time with Shelley. During the class, I can’t ask her questions since she is teaching, so I only have a small window of time in between the classes she teaches to ask her questions and work with her. I have tried to set up time before and after her classes, but there really isn’t much of it, so I don’t get a long time with her on-on-one. 2. What is working well? Why? 3. What could be working better? How can you make sure this happens? Since we don’t have a lot of time together before and after classes, it would be better if we were to either a) meet up somewhere outside of the class time for longer periods instead of the brief meetings we have been having or b) contact each other through email or another form of communication to discuss anything that comes up throughout the week. I only get to see her once a week, so being able to reach out and contact her during the week would definitely help me grow. After the next class I will discuss these options with her or ask for her suggestions to make sure we are both on the same page and can get the most out of this mentoring experience.